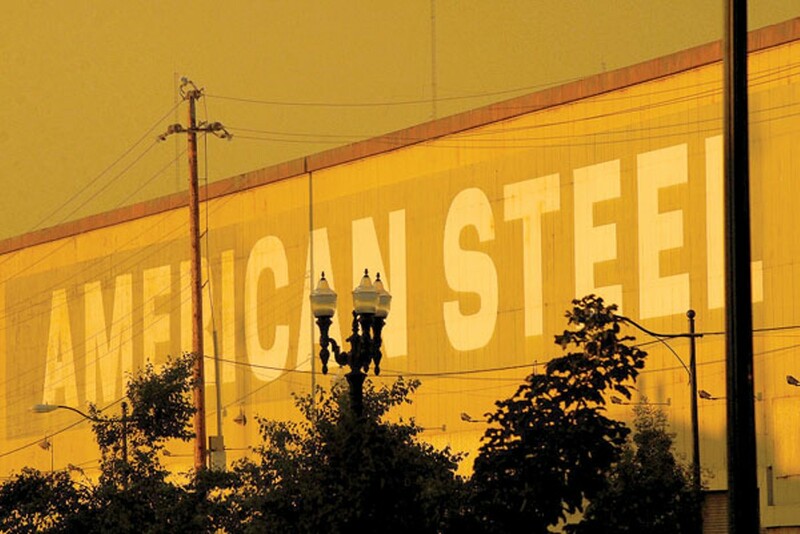 How a metalworker from Burning Man became the maestro of the huge American Steel artist complex. 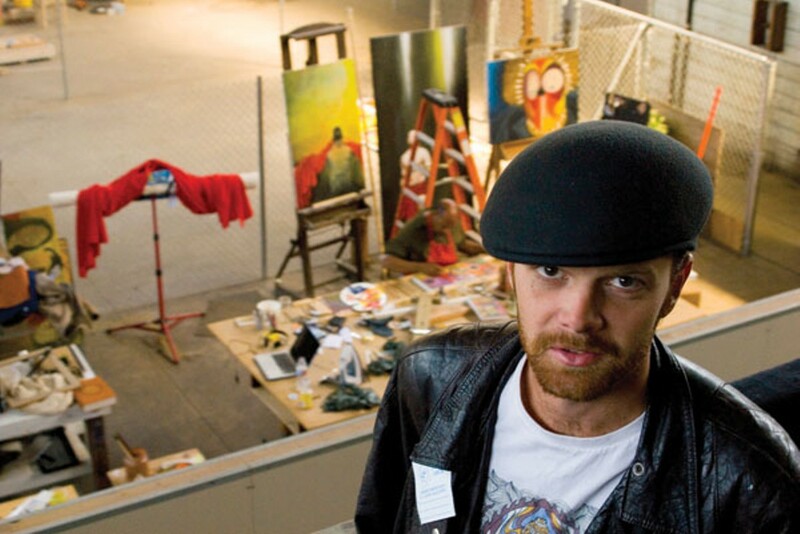 Das Mann operates a crane at his West Oakland artist facility. 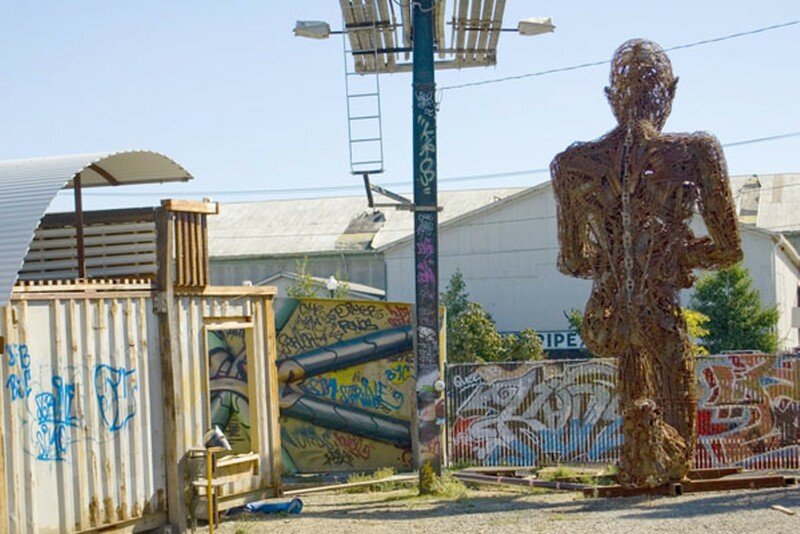 When Dan Das Mann moved to the Bay Area in 1996, one of the first things he did was help build a metal shop at a large San Francisco artist collective. People at the Cell Space arts complex were always going on and on about "Burning Man, Burning Man, you got to go to Burning Man!" So in 1997, Dan made his way out to the desert for the first time. "I'm just walking around looking for something to do and I walk up to this guy," he recently recalled. "And he's been working trying to make this ten-foot ball of ice in the middle of the desert." The guy was Jim Mason, a prominent Bay Area artist. Mason had started out with a team of assistants, but after a few days his project seemed hopeless and the crew lost interest. However, something about it all attracted Das Mann. "Everyone had abandoned the project because it was failing; it was falling apart," he recalled. "And he was walking around talking to himself. He'd been up for three days trying to finish this thing." That's when Das Mann offered his assistance. Mason turned him down. But Das Mann was nothing if not persistent. "He can't even move anymore," he recalled of Mason. "And I'm up there cutting the mold, doing crazy stuff and electrocuting myself, and he's like, 'Dan I just can't go anymore. I'm just too far gone.'" "I said, 'Go to sleep, and when you wake up this thing's going to be done.'" As Das Mann tells the story, when eight in the morning rolled around, there was a ball of ice in the middle of the desert. So he and Mason struck up a friendship, and the following year Mason introduced Das Mann to some people who would prove to be important to him. "He brought Larry Harvey over to my studio in the spring, and he's like, 'I want you to meet Larry Harvey, the founder of Burning Man,'" Das Mann said. "Jim and Larry were good friends because Jim was this maniac artist doing the coolest stuff." 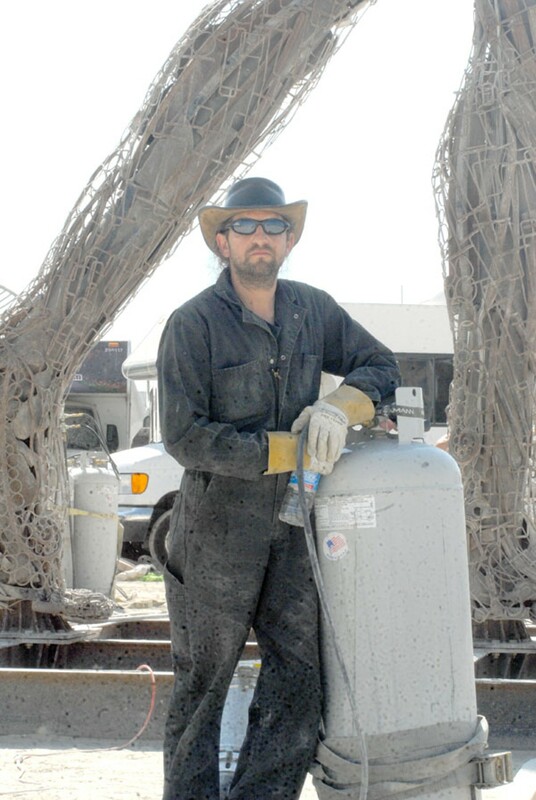 Harvey ended up helping to fund Das Mann's 1998 project for Burning Man — a 25-foot-tall copper tree that spouted fire and water. He also gave Das Mann a coveted spot in which to display his tree, where Burners could walk up and play in the water during the day and marvel at the blasting fire at night. Eventually, Das Mann received commissions to build several more trees, including one for a private investor and another for an Australian aboriginal tribe. "That was the beginning," Das Mann recalls today. "I had always had these visions — small concepts, but I wanted them to be major installations — interactive things that people could experience in a full way that would emotionally change them. You can do that with small things, but big things at Burning Man can really do that. And that spoke to me." So Das Mann went on to become a Burning Man regular. And if he didn't know anybody thirteen years ago during his first visit, by this year he pretty much knew everybody. As he sat in a chair under a large shade structure looking up at a thirty-foot-tall metal woman named Ecstasy, all around him people lazed on couches, some smoking, others fixing breakfast in a kitchen area equipped with several refrigerators and a stove. "Our goal for many years was to do it all: make the art, make the camp, have the good fun times, not burn yourself out," he said contentedly, reveling in his eighty-person camp. "And we solved it after thirteen tries." The accommodations certainly impressed. His camp provided electricity, a meal plan, a mostly operational shower, a graywater evaporation pond, plenty of camping space, a commodious shaded common area, and prime real estate on the main drag, facing the action. Not to mention the camp's festive amenities, which included a twenty-foot-wide dance pit beneath the giant metal woman — encircled by a ring of fire. But perhaps most notably, the fabled drama of years passed seemed nonexistent at this year's camp. "I came up with the idea to do a performance deposit," he said. "So everybody in the camp has to do an eight-hour shift ... and everyone pays a $200 deposit against their work. So when they do their job they get the money back. And that little maneuver changed the entire dynamic because now everyone's working together." Organizing volunteers in the desert may not seem impressive to people who are familiar with Das Mann's large metal sculptures. But he doesn't see it that way because lately he's been focused on fine-tuning his managerial skills. "I've been calling myself a conductor," he said. "I think of what I do, and what the people I work with do, kind of like a symphony." Das Mann's latest symphony is taking place at an enormous building in West Oakland. He and his business partner, Karen Cusolito, recently became the sole leaseholders of the Big Art Studios at American Steel. It's a 250,000-square-foot warehouse housing eighteen bridge cranes and 300 to 400 artists at any given time. 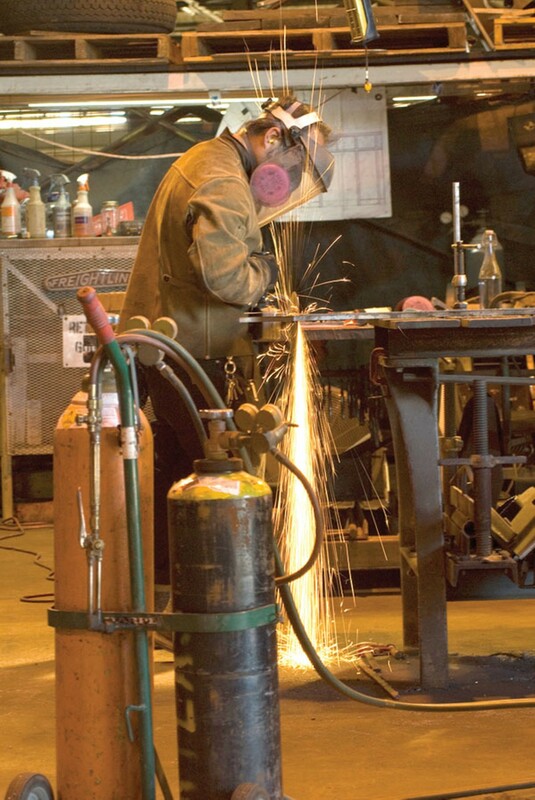 Many tenants use the space to create metal sculptures. But there's a whole warehouse for painters, jewelry designers, and other fine artists, as well as a recording studio for DJs and others musicians. They also rent space to small nonprofits. Abel Manzo says he has been wrongfully put on Oakland's gang injunction list. But he has no constitutional right to an attorney.